A Perfect Posture is the foundation of all exercise and movement. It will pay dividends throughout your life. This guide is dedicated to helping you achieve that perfect posture. These guidelines are a part of my Health Guides series. Oh, hi! Welcome to MelioGuide. I’m Margaret Martin. Just joking on the iPhone. But, it drives me crazy when I’m driving by bus stops and I see all the kids here, and here, and sometimes I’ve even seen the head horizontal. I can’t even do it. I’m not even flexible enough. An article on posture in “The Washington Post” dated November of 2014 had a great illustration in terms of the effect on the spine of the head posture. Our head — which is a lovely 10 to 11 pounds, sits where it should, right over the spine — then it’s a great weight-bearing device. The article in the Washington Post states that when the head is sitting right over the spine, the weight is distributed evenly. But when you’re stooped forward 15 degrees, that weight starts to increase significantly to the point that it might weigh about 27 pounds! That is a lot of pressure on your spinal column. By the time you are leaning forward at 60 degrees — which is not uncommon when people are texting, looking at their phone, or reading from their phone — then the weight of the head starts to feel more like 60 pounds on the spine! That is dangerously high. Put that on top of a spine that might already be forward, and the cumulative effects throughout the day on the spine is huge, both on the muscles, on inappropriate weight-bearing through the bone, on the joints, and on so many things. 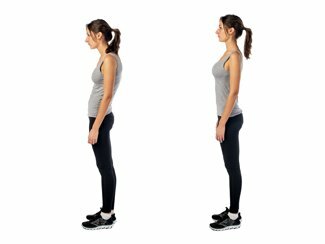 This guide to perfect posture takes you through the importance of head posture, but also guides you through alignment of your head when you’re doing exercises, when you’re working on core control, and daily activities. I hope that you find this guide to perfect posture helpful and I encourage you to hold your head taller and be a little bit more aware of your posture throughout the day. Thanks for tuning in. Here are the important articles on perfect posture you should read. I have them organize by topic category. The osteoporosis posture is more accurately known as the kyphotic posture or dowager’s hump. This flexed posture commonly associated with osteoporosis in older individuals. In this video blog, I describe, in detail, what happens to your spinal or vertebral structure when you regularly have a poor posture or are in flexion, how compression fractures happen, and throw some light on bone density. I also answer a client’s question about how many exercises does she need to do to correct her postural alignment. Are more posture exercises better than less? I have written a comprehensive blog post on Dowager’s Hump. I see many patients with rounded shoulders and work with them on strategies to fix this condition. Rounded shoulders can develop into hyper kyphosis and Dowager’s Hump, and lead to compression fractures and shoulder blade pain. Read this post on how to fix rounded shoulders. A good posture requires that you be mindful of your alignment during all of your daily activities. It requires commitment and attention. Posture is an active process. I find that most people do not have a good posture because they are not encouraged to sit up right, the seats they sit in are too soft or deep, or they use their laptops in bed. Today’s lifestyle can obstruct good alignment. Daily slumping makes it feels strenuous when you actively try to improve your posture. You have to actively work to improve your alignment. But I find that when clients finally achieve good alignment, they feel much stronger and confident. And maintaining it is actually very easy. Perfect posture has many benefits and is essential when you exercise. 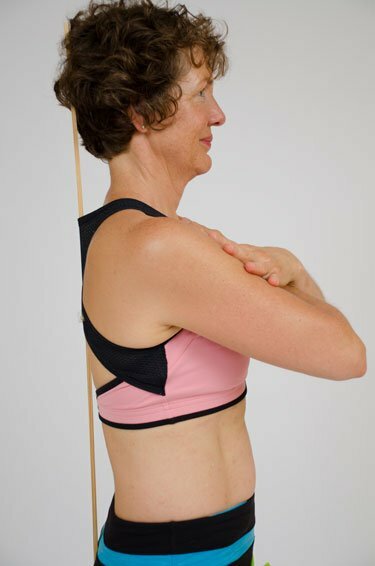 Hi, I’m Margaret Martin at MelioGuide, and today I’m going to share with you a topic that’s very important to my heart and to my spine, and that’s postural alignment. A lot of my clients come in and as soon as they walk in the door, I can tell they’re just standing a little bit taller. They often will tell me that they hear my voice on their shoulder all time. I wish my kids would tell me the same thing. So often I guess I just assume people realize that maintaining a perfect posture is an active process. But in this day and age people aren’t encouraged to sit up tall. They’re sitting slouched on soft surfaces. Everything’s too deep. Everything’s too soft. My kids were home for Christmas. I was blown away how much time they spend in their bed watching entertainment on their laptop. So much of their time was in a reclined or semi-reclined position. Where’s all that work for the postural muscles? It’s just not happening today. That means, when we do stand up tall, it’s actually feels like even more effort. But we should be actively engaging our postural muscles throughout the day. Sitting on the edges of chairs, standing tall. And it’s so very important when we’re doing weights that we’re keeping our posture in its very best position, because you don’t want to be training yourself to be slouching even more. You want to be training yourself and lifting yourself up and against the weight that you’re holding. And so, is posture an active process? Absolutely. And the more you do it, the more comfortable you’re going to feel doing it. So often when my clients that have come to me, and I can’t help it, but when they’re sitting in front of me and they have poor posture, that’s all I see over and over again. But when they come back and I don’t even think about their posture, I know they’re sitting tall. They will say to me, generally at the three month mark, that sitting and standing tall is actually starting to feel normal. That slouching starts to not feel as comfortable. So be patient with yourself, but persist at optimizing your alignment so that you can then feel like this active process of posture becomes effortless and just a comfortable way of being. Know that you’re going to be supporting your bones in their very best alignment so that they can keep supporting you for the rest of our life. I offer clients and patients a custom Posture Alignment Therapy program where they have the opportunity to work with me and improve their postural alignment. In the video on posture and exercise, I initially discuss that you need proper alignment when you do your exercises and that the purpose of the postural exercises is to stretch and strengthen the muscles that regain and maintain proper alignment. Ken, one of my clients, then provides his personal experience: how you can hurt yourself if you do not execute your movements and exercises with proper posture. Ken states that form is important. He used to do weights for strength training and swim for cardiovascular. Like many people he took posture for granted. Most of the activities of everyday life, such as sitting at your computer, bring us into forward positions. If you are not meticulous about your alignment throughout the day, then gravity will gradually pull your head forward – and soon your spine will follow. This flexion of the spine (reflected in a slouched posture) increases your risk of a vertebral fracture. Once he came to realize its importance in everything he did — his activities of daily living and his exercise activities — he worked on exercises to improve his posture and to maintain good posture. Here is a spine exercise for good posture I did a number of years ago, the Spinal Stretch Posture exercise. Modern life has been good to many of us. Smartphones and computers give us immediate access to information, resources, and friends. However, these same products often cause us to go into forward positions that can lead to poor posture. Many activities of daily living, when not done with good form, also cause bad alignment. That is why I prepared this guide to good posture. Poor posture can lead to low back pain. For people with osteoporosis, osteopenia, and low bone density, flexion of the spine increases the risk of vertebral fracture. Postural exercises are a foundational component in the MelioGuide Exercise for Better Bones program. Postural improvement is one of the goals in my new book, Strengthen Your Core. Postural alignment is key for people with osteoporosis who practice yoga. I discuss postural alignment in detail in my book, Yoga for Better Bones. In earlier blogs, I have covered the Reverse Fly Exercise and modifications to help you improve your posture. And my activities of daily living articles on raking leaves, shovelling, lifting heavy objects, mowing your lawn, and weeding your garden all cover good posture, good alignment and good form. I will add more resources and information on perfect posture in the future. Stay tuned and thanks for following.